mmo-champion has a post dedicated (almost) entirely to the new possible mounts and vanity pets found on the 4.1 PTR. if you missed wowhead's 3D models of the baby felines, mmo-champ has a screenshot showcasing them. 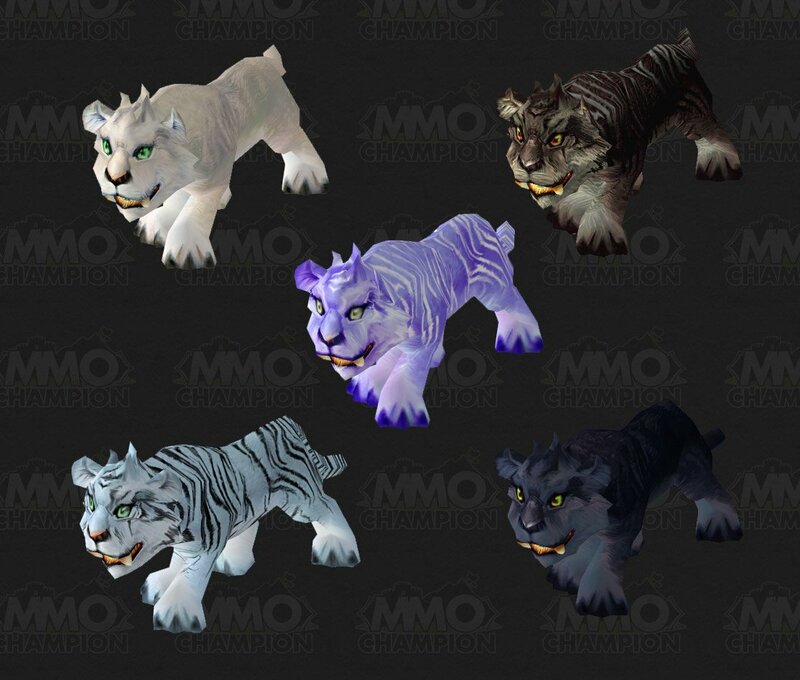 just to clarify some things - although there are five different colored cubs, so far i've only heard of TWO being actual vanity pets and that are available to players on the PTR - the winterspring cub (purple stripes) and the nightsaber cub (the black cub with grey stripes). the panther cub (all black) is speculated to be a (rare?) drop from a mob found within the new ZG 5 man instance or other troll-ish area/zone. no confirmed drop has been found yet though. "Nightsaber Cub will be a WoW TCG rewards but other versions of the panther cubs will be available through questing/rare drops apparently." what can we take away from this? it sounds as though there may be more than one way to obtain a nightsaber cub, but we'll have to wait for more information on this one. perhaps rather than the nightsaber cub, this info was meant for the panther cub? last but not least, harval from WarcraftPets.com found an interesting bush chicken spell. it hasn't been assigned a proper item ID, summonable NPC, or even an actual name (lol at "summon test pet"), but for all those who adore the waddling little critters in twilight highlands, cross your fingers! maybe developers will sneak in a bush chicken companion in the future. sadly, due to a bug (that's existed since 4.0.6 apparently), because i participated in the cataclysm beta, i'm unable to take part in the 4.1 PTR. this is afflicting many players, but not all beta participants. until there's a work-around or fix, i'll be relying on reports and information found outside of the PTR for any updates on 4.1. it's not ideal, but i've been pet starved lately so... i'll take what i can get! XD if you have any new info, feel free to comment or send me a message through WarcraftPets.com. nightsaber cub - redeemable from landro longshot in booty bay. this pet will be the common loot code for the TCG expansion deck, "Twilight of the Dragons", due for release in late june. winterspring cub - vendor in everlook inn in winterspring, Michelle De Rum, currently sells the winterspring cub for 50g. this IS a non-combat pet and its summoning spell can be learned. panther cub - unknown source atm, however wowinsider has a short video of this pet's model and possible idle animation on youtube. update #1: wowhead has some nice 3D images of the possible cubs over here! update#3: there may be more than one winterspring cub in the works. judging from the 3D models wowhead has discovered, and the item and spell(s) for the winterspring cub, an actual vanity pet may be available as well as the mount quest item. a few users over at WarcraftPets have already found possible locations for both the nightsaber cub and winterspring cub on the PTR. the nightsaber cub is currently an option from landro longshot under "Twilight of the Dragons" on the test realms, so there's a high probability it's the common loot card from the next, next TCG expansion set (after "War of the Elements", which is releasing in march or april, i believe). the winterspring cub, as one would expect, has been found in winterspring on the PTR as part of the frostsaber grind for the mount. it looks like the alliance version of the mount quest(s) has been updated to match the horde venomhide mount quest(s) in un'goro. currently, the winterspring cub doesn't seem to be a true vanity pet, though, and is only part of the mount grind and usable only in the questing zone. it's still fairly early so things could change. we'll just have to wait and see! LOTS of new pet-related news from the PTR 4.1 on mmo-champ! - Petting Zoo: Collect 100 unique companion pets. - Menagerie: Collect 125 unique companion pets. no info on if the two new achievements will have corresponding rewards or not, but there's still time before the release of Patch 4.1, so we can hope! there's also no info on how to obtain the new pets either. i'd like to note that the three new pets already have placeholder item IDs as well as spell IDs. this, however, does NOT guarantee that they will go live. anything found on the PTR always has the chance to NOT go live. just keep that in mind. also, landro's lil xt has two spell IDs listed on wowhead's PTR site atm. it doesn't make much sense that blizzard would release a THIRD version of lil' xt, so my best guess is that this newest one will be what the TCG version was SUPPOSED to look like (but for whatever reason, was not released as). if this is true, this will likely drive the price of this common loot item pet up a bit since it will be more unique and not a carbon copy of a blizzard PetStore item. as this year's in-game valentine's holiday event comes to a close, i wonder about future in-game events. it's pretty apparent that the changed holiday loot system is still disliked by many (but it DOES have its supporters). whether or not blizzard plans on making additional changes to the system in the future... it's hard to say. my guess is that there won't be any further changes and this is just going to be the way it is. one chance per day, per toon for a holiday specific pet/item. there are those in favor of this system, there are those who are against it, and there are some who don't really mind either way. whatever side you bat for (if any at all), there are some things that can be agreed upon: in general, collectors must combat the following factors when it comes to acquiring holiday pets..
one or two of the above would be reasonable, however, collectors are dealing with all four obstacles (more if i'm forgetting any factors). it can cause quite a bit of anxiety for a player, especially if collecting/completion-ism is their chosen style of gameplay. i'm not sure if this has been happening to anyone else. a quick scan of the official forums, wowhead comments, and so on didn't reveal much, but lately brazie's sunflower has been hurling a short and quick fire burst onto my character's chest whenever it breaks into song. there's no actual damage done, but it was quite alarming when it first happened. i thought i had agro'd something or that i was flagged for pvp and a mage was on me. i'm not sure when this started, but i'm guessing it has something to do with the patch. if it's and intentional change.. well i have no idea what the purpose of it is. if it's unintentional and more like a bug, it's a pretty amusing one. update - as detailed in the comments below, withers and the teldrassil sproutling models are bugged. - withers got a model update is bugged! - the teldrassil sproutling also had its model color changed to match that of withers is bugged. hopefully our two little friends will return to their original states soon! it may take a moment for the moonkin hatchling to get off the ground, but once in flight mode this companion WILL fly along side your flying mount and/or flight form. when on the ground, it will proceed to waddle next to you as normal. yes, these two pets are back with patch 4.0.6! the smolderweb hatchling and worg pup are now drops from two bosses within lower blackrock spire. so far they seem to be 100% droprate and still bind on pick up. the hatchling drops from mother smolderweb, while the pup drops from quartermaster zigris. although i'll miss the quests that ultimately rewarded these two pets, i'm glad to see that blizzard didn't forget these two wonderful, classic companions and has found homes for them in cataclysm. - doesn't make any sound. - this man... pet... is on the same cooldown as the guild page. the herald is on a shorter cooldown than the page (4 hours vs. 8 hours), but they still share the same cooldown lockout. interesting. - he sells the guild rewards also like the guild page. - the only differences i can see between the two is the clothing that they wear. on-click vocals. ...haircut? - other than that, it's a clone of the guild page. heck, they even cost the same amount of gold. - Additional animations have been added to the Armadillo Pet guild reward. - The Disgusting Oozeling no longer applies a debuff which reduces defense, a deprecated stat. i'm quite excited for the armadillo pup! i'm not even sure what the original animation(s) was for this little one, but adding even more is intriguing. unfortunately, there is still no mention of the united nations "bug" and if there will be a "fix" for it or not. it's frustrating and aggravating, but my hope is that blizzard is delaying any response on this issue to give themselves some extra time to work on the dark phoenix hatchling and make it more unique/desirable. am i being too optimistic? well, we'll see. the valentine's in-game holiday just kicked off tonight. good luck to all going after peddlefeet and the toxic wasteling! if you're having trouble finding how to get to the crown chemical co. boss (it wasn't showing up in the dungeon finder tab for me), simply head to the love is in the air NPCs and one of them should queue you for the holiday boss after speaking with him. as far as i know there are no new valentine's event pets. which is a good and bad thing imo. good since there are still many players working on obtaining the two existing companions, and adding another may only cause more stress for them. bad for those who have already acquired both peddlefeet and the wasteling; no pets for us to collect. there are other things to do during the event, though. personally i'm going to try for the forever-lovely rose. i missed out on it during the period when holiday bosses were farmable. i didn't realize just how awesome it was until it was too late and blizzard made the change to how vanity items and holiday bosses work. there are also two v-day dailies offered, which DO give guild reputation. (hooray!) i'll be working on those to help my grind to exalted with my guild.